Delay condoned in filing the special leave petitions. court. Accordingly, the first appeal was dismissed on 5.8.2005. Section. The review also was accordingly dismissed. which would include not only his widow but also his unmarried daughters. left no male issue shall be entitled to share with them. entitled to share with them. partition among other co-parceners in a joint family. classes of females enumerated in the above sub-sections. an instrument, only a limited estate. his hands upon partition or otherwise. reason of partition and not by survivorship. himself in the year 1946 when Chowdappa became a single coparcener. interest in the joint family property of the deceased while he was alive. Joint Family along with his father and brothers. 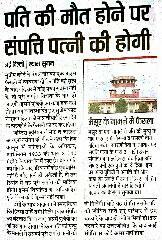 reason that the property held was not received by survivorship. 8(1)(d) are not entitled to a share in the estate left by the deceased. its scope should be restricted by assuming a partition.” (at page No.128). coparcener not by survivorship but by partition. A recent view of Section 8(1)(d) in Smt. Ramakka and others v. Smt. 1335, has been taken by a Division Bench of the Karnataka High Court. has by law or under the terms of an instrument only a limited estate. will have to be allowed and the judgments of the courts below set aside. The suit will stand dismissed as a consequence.